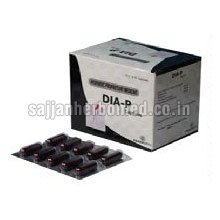 Our company is a well-known Supplier of DIA-P Capsules. Prepared using natural herbs, the DIA-P Capsules are indicated for controlling diabetes. These capsules conatin 200 mg Salacia reticulata and 100 mg Vijayasara. The mass extract of triphala, khadirakramukadi kashaya and salasarasadi gana kashaya is 200 mg. These capsules prevent and cure different complications of diabetes like neuropathy, nephropathy and vasculopathy. Our DIA-P Capsules cause no side effects and should be consumed strictly as per the prescription.